Precious items demand safekeeping and appropriate presentation. THE TREASURY from the House of BUBEN&ZORWEG is one of the most beautiful opportunities to stop the hands of time. To save things for good times to be enjoyed in good company. To present wrist watches, enjoy exquisite cigars and share fine wines … and because good taste is a very personal matter, the modules that make up THE TREASURY adapt to the needs of their proud owner. A perfectly designed surrounding for the things close to your heart. „There is no greater pleasure for discerning watch aficionados than to display their passion for exceptional creations against the background of a masterpiece of craftsmanship. The Treasury provides the ideal setting for doing so“, says Christian Zörweg in describing the benefits of the masterpiece. The pleasure of having the freedom to design one’s own time – that is the overriding design principle of THE TREASURY. Where else can one celebrate the passage of time with greater enjoyment than with a refined cigar. A cigar that has mellowed in the Treasury’s humidor in anticipation of the moment. And with fine wines from the bar and presentation module. The central FINE TIMEPIECE is a reference piece that stands above all of the smaller treasures of time: the valuable wrist watches, the mechanics of which are held in optimal time by the TIME MOVER®. 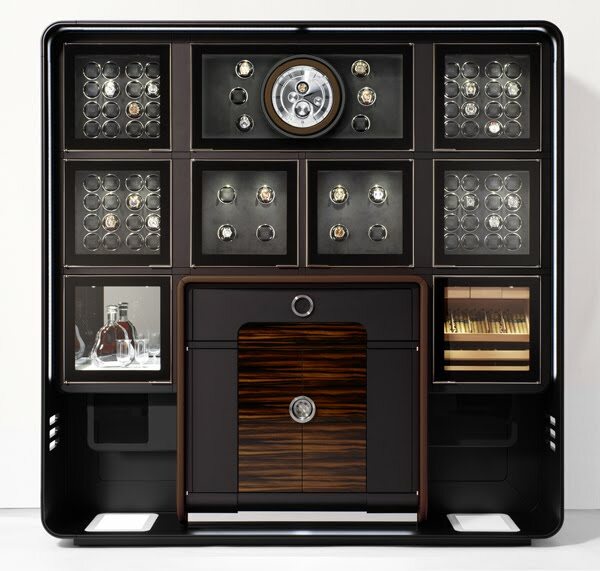 German-made safe with an integrated high-end HiFi system … everything is combined according to the customer’s individual wishes to create a unique OBJECT OF TIME.